There is a strong heraldic tradition in the world of the White City, thus knowledge of heraldry can be fantastically useful if you want to interact with the nobility in a useful way. The construction of coats of arms ultimately comes down to the preference of the original bearer. The nobility of the White City are closer to being merchant princes than feudal lords, so an awful lot of heraldry is affectation. For all the discussion of symbolism which is to follow, heraldic devices are often perfectly literal, and a great many of them just seemed like a good idea at the time. Spiders, for example, feature prominently in the designs of the Family De Almedia, partially this is because of their symbolic connection with perseverance and industry but mostly it just comes from the fact that the De Almedias owe most of their fortune to the spiders and Weavers of the City of Silk. Blazonry is the science of describing the design of a coat of arms. It uses old vocabulary, dating back over 700 years to the time of the Civil War- and in some cases back over a thousand years, to before the Naming & Binding War. 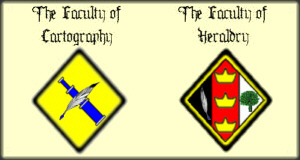 It is taught in the White City at the College of the Thousand Arts' Faculty of Heraldry, who maintain the definitive lists of all armorial grants. Constructing a simple blazon is done in three steps. First a shield shape is chosen, then a field (background) colour, and then a charge (an object in the foreground). Shields come in three broad styles; escutcheons, cartouches and lozenges. The Escutcheon is by far the most common, and is the traditional… well… shield shape. It is used by warriors or families with a history of being warriors. The Cartouche - the oval field - is used for priests, sorcerers and mystics. Gold (Or) - Associated with the sun but not with the Light (the Light is not so gaudy). Also associated with the more masculine Princes of Breath and Old Powers. Silver/White (Argent) - Associated with the moon and, if white, with the Light. Also associated with the female Princes of Breath, the female Old Powers, the Burned Lords and sometimes with the Vitriarchs. Shattered Glass (Octargent) - This is the term used for the field divided into a gyronny of eight, each segment a different shade of silver. Used as the field for the arms of the D'Artois Family, the heraldry of the Vitriarchs and the arms of a number of organisations from the old Port of Glass. Black (Sable) - Associated with the Black Flame, the Burned Lords and sometimes with the Light (there are those who insist that the Light shines most brightly in the Darkness, when only the Light Within remains strong). Also associated with those who have a burning desire to seem sinister and impressive. Red (Gules) - Loosely associated with the Old Powers (although less so than Blood-Red for obvious reasons), red tends to be associated with warrior-virtues - honour, valour, that kind of thing - and as such it tends to be present in the arms of those who display those virtues, or those who wish that they did. Blood-Red (Sanguine) - Guess what, this one is tied to the Old Powers. Since heraldry passes along bloodline, and since a lot of the older Families started out as warrior types, this is a colour that shows up quite a lot. It has fallen out of favour in recent years, as while it does have connotations of military victory the word best used to describe those victories is not so much “glorious” as “bloody”. Green (Vert) - Tends to be one for the more pastoral types. It has some associations with the Old Powers and some associations with the more rustic Princes of Breath, but in general Green tends to be used as the colour of the home and the hearth. Blue (Azure) - This one, naturally, is associated with the Princes of Breath, and therefore also with culture, learning, death, disease and all of the other dozens of things the Princes concern themselves with. This one's a popular colour with the nobility who aren't of strictly martial heritage. Purple (Purpure) - Associated with the Namers. Worn by the Empire of the Unbound in the Far West and by the Unnamed King, Emperor of the New World, in the Far East. A sign either of Name worship or of defiance of the Namers. Grey (Gris) - Associated with the Burned Lords. Brown (Tenne) - Minor associations with the Lord of Sand and Stone. Also, more famously, used on the College of the Thousand Arts arms. There are two main types of charge. Ordinaries are thick lines across a shield, whilst other charges are graphical depictions of mundane objects. Note that in heraldry one always assumes that one is looking at the shield from behind when describing left (sinister) and right (dexter). The names of the first 6 ordinaries (Pale, Fess, Bend, Bend Sinister, Chevron, or Saltire, but not Pile, Chief or Bordure) can also be used to make the background several colours. 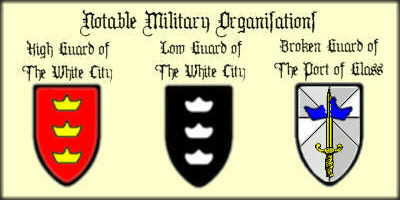 For example On an Escutcheon Argent, a Pale Sable is a white shield with a black vertical line on it, like the first image in the above diagram. However An Escutcheon per pale Argent and Sable is a shield split vertically, half white and half black. Note that in the White City quartering and impalement are not commonly used techniques, instead families that marry combine charges or colours from both sides. See the Nobles section below for more details. Chains in the heraldry of the White City world are either the sign of an extremely old Family - one that goes back to the Binding War no less - or else an omen of extreme ill fortune. Since the White City does not have a Christian tradition (being set in an invented world and all) crosses are less loaded with symbolism than they might be, and conversely most symbols you care to choose will probably be associated with some Power or other. Animals can be described in a huge variety of poses, including rampant (the typical heraldic pose, on one leg), salient (springing from two legs), passant (standing on three legs, front one raised), statant (on four legs), sejant (seated), couchant (lying on all fours with head up, like a sphinx), or dormant (sleeping). Birds are drawn erect (similar to rampant, standing upright facing right with both wings on left side) or displayed ('spread-eagled'). Heads look towards the right, unless they are guardant (looking out at the viewer). There are formal rules dictating the order of how you write blazons, and concerning punctuation. Nouns (shield shapes or charges) are capitalised, as are colours or metals (e.g. a Sword erect Argent.) Colours or metals always come after the objects they are describing (e.g. a Sword erect Argent, not an Argent Sword erect.) Blazons always work from the background up (i.e. they first describe the shield shape and colour, then any ordinaries except a Chief or Bordure on the shield, then any charges on the shield, then any charges on ordinaries, then any Bordures or Chiefs and any charges on them). Each level is separated by a comma. Blazons normally work from dexter to sinister, but if there is a Fess, Bend Sinister or Chevron they work from chief to base (top to bottom). 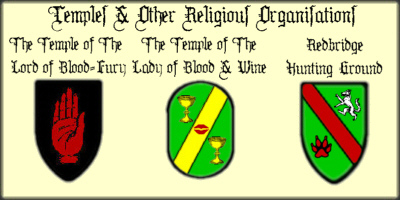 Gods and Powers don't generally go in for coats of arms, but their followers and cults and temples often do. The following is by no means a comprehensive list - after all, there are almost as many ideas of religious symbolism in the world as there are priests. Blood, most animals but particularly deer and wolves, simple designs Sanguine, spiders, plants. Redbridge Hunting Ground - On an Escutcheon Vert, a Bend Sanguine, between a Wolf rampant Argent and a Wolf-Paw Sanguine. (A green shield with a white wolf and a blood-red paw divided by a wide diagonal blood-red stripe.) The Bend Sanguine symbolises the river dyed red by Ripper Bill's blood, the white wolf is a reference to Vincenzi's Bloodwolves that guard the area, and the blood-red paw is the symbol of Ulf, the protector and priest of Redbridge. Simplicity. Eyes. Suns (especially Sun in splendour, the sun with its rays) and Stars (a Mullet is a geometric star and an Etoile is a star with wavy rays) Argent. Irradiated charges (charges with rays coming off). The Light abhors gaudiness, so excessive decoration or use of Or is unusual. The Temple of the Light at Guang Shan - On a Cartouche Argent, a Plate irradiated Sable. (A white disk with black rays, on a white shield.) These are the arms of Guang Shan, 'The Peak of Light' to the far north-west. The True Servants of the Light - On an Escutcheon Sable, a Sword erect Argent. (Black shield with a white sword.) Used by the followers of Marius, reflecting his militant outlook on purifying the world by the sword. Wind & the Princes of the Breath - Birds, winds and waves. Particularly simple or particularly complex designs. Ash & the Burned Lords - Associations include carrion birds (the Lord of the Field of Battle), Talbots (a type of hound, used for the Lord of the Faithful), and anything burned or eradicated (that's 'torn up by the roots' in layman's terms). The Temple of the Lord of the Gardens - On a Cartouche Vert, a Figure robed Argent transfixed by a Lance Azure, in chief a Rose eradicated Argent, Gules or Sable. (A silver-coloured robed figure pierced with a blue spear below a red, white or black rose torn up by the roots, on a green oval field.) No longer used, although see below for the Cult of the Broken Gardener. Glass & the Vitriarchs - More or less anything really, but it's usually chaotic. Octargent fields. Animals Coward, Defamed or Vulned. The Cult of the Broken Gardener - On a Cartouche per pale Sable and Argent, a Rose eradicated Gules (A red rose torn up by the roots, on a half-black half-silver oval field.) An alternative: On a Cartouche Octargent, a Rose eradicated Sable (A black rose torn up by the roots, on an shattered silver oval field.) Based on the Temple of the Lord of the Gardens, these are two of the many designs used by the cult of the newest Vitriarch. The Black Flame - Black flames & hearts (obviously) and daggers (symbolising sacrifice). Personal Arms of noble followers tend to be ornate and feature Family charges altered by making them flaming Sable, whilst the various cults for commoners tend to have very simple stylised designs. The Noble Cult of the Black Flame - On an Escutcheon Argent, above Flames Sable, a Heart Sanguine flaming Sable pierced by a Dagger Or. (A blood red heart set on light with black flames and pierced by a golden dagger, above black flames, on a white shield.) The coat of arms adopted by the nobles in the White City who, led by Belor de Velland, dedicated themselves to burning the hearts of Marius' followers in the name of the Black Flame during the recent revolution. The Bound Ones - Few followers of the Bound Ones are sane enough to use heraldry, but those that do seem to favour purpure (purple). The mysterious Empire of the Unbound is known to have soldiers who wear purple tabards, for example. See also the Army of the Red Gryphon (below). Dream - Anything and everything, ever-shifting and never-fixed, changing every night. Heralds try to avoid the Whistful City, or take lots of drugs to cope. On an Escutcheon Gules or Argent, three Crowns Or. (Three gold crowns - the Governor's crest - on a white or red background.) Rank-and-file High Guardsmen usually wear tabards with this shield over their armour. A note on the High Guard: Tradition states that the four High Captains of the High Guard (drawn from the four most prominent noble Families of the White City) are entitled to use the “City Shield”, an impalement of their Family arms next to the Governor's crowns, split down the middle by a gold band bearing a crowned black halberd to represent their office. (See Matteus De Almedia's shield, below, as an example.) This does mean that the City Shield of the De Courci High Captain looks a bit silly, but apparently they take it in good humour. The real ceremonial halberds which inform this shield, originally carried by the four High Captains, were missing since their daring theft some fifty years ago and the City had all but given up hope of their recovery - though the decree made at the time, that anyone who restored the halberds to their rightful place would be immediately elevated to the nobility, be he or she of never such low birth, was never revoked. They were recently recovered by a group of adventurers working for the City, having been stolen and hidden by the first king of the White City's thieves. On an Escutcheon Sable, three Crowns Argent. (Three silver crowns on a black background.) Effectively the heraldic inverse of the High Guard arms. The ebony badges of the Low Guard are just about the only things ever to bear these arms, since most Low Guardsmen aren't exactly interested in advertising their affiliation. On an Escutcheon Octargent, a Sword erect Or crowned rompu Azure. (On a field split into eight segments, each coloured a different shade of silver, a golden sword presented hilt-down and crowned with a broken blue crown.) Still used by the Broken Guard on the Isle of the Broken Moon and the Embassies, though the Obsidian Guard in the Port of Glass and Flame has its own arms. On an Escutcheon Sable, a Gryphon rampant Gules. (On a black field, a red gryphon.) The recently-defeated army displayed this shield on a red tabard. On a Lozenge Tenne, a Compass Rose Argent edged Or, between two Quill-Pens Argent nibbed Azure. (A silver compass rose edged with gold, with a silver quill-pen [with blue decoration] on either side, on a brown diamond field.) 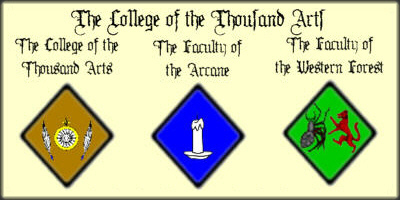 This is the shield of the College of the Thousand Arts, whose origins are traceable to before the founding of the College itself when the tallest spire in the city (now the Cartography Tower) was originally a temple to the Rose Princes. A small shrine is still carefully maintained at the highest point of this spire. An old legend has it that if any person is courageous enough to gain a blessing from all four Rose Princes and then to stand atop the spire during a lightning storm and survive, they will gain mastery over the Four Winds for a year and a day. Although several attempts have been made to prove the veracity of this legend, none have yet succeeded in gaining the blessing of all four Rose Princes and returning to the White City alive. The Faculty of the Western Forest - On a Lozenge Vert, a Spider rampant guardant Sable combattant a Wolf rampant Sanguine. (A forward-facing black spider, rearing as if to attack a blood-red wolf, also rearing, on a green diamond field.) Note that the spider in this coat of arms is no coincidence - before this Faculty's recent fall into disgrace, the De Almedias often hired their children's tutors from among the Western Forest Faculty's graduates. The Faculty of Heraldry - On a Lozenge per pale Sable and Argent, on a Pale Gules, between a Quill Argent nibbed Azure and an Oak Proper, three crowns Or, within a Bordure Or. (A shield split into three thirds, vertically: the first third is black and has a white & blue quill on; the second has 3 gold crowns on a red background; and the third has an oak on a white background.) This is one of the most technically complex arms in the White City, combining as it does a division, an ordinary, and a bordure. Indeed, constructing the blazon is a problem often used to test undergraduates in the Faculty. It features the quill of the College, the Arms of the Governor (originally they were named “The Faculty of the Governor's Heralds”) and a tree to show the Faculty's role as the city's leading genealogists. Whilst heraldry originated with the military and is also used by various religious and secular authorities, it is the nobility who use it the most. Various charges and their alignments are all used to indicate which Family a noble belongs to, who their relatives are, and their level of importance inside the Family. There are, broadly speaking, three types of Noble Arms: Family Arms, Personal Arms and the City Shields. Each Family has its own Family Arms. These have normally remained unchanged for generations, and are often but not always used as the Personal Arms of the Head of the Family (and sometimes their spouse). Each other member of the family will have their own Personal Arms, which often resemble the Family Arms with some small alteration for difference. 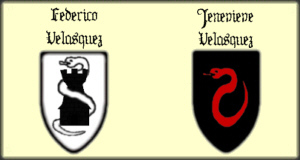 Toquell Velasquez, for instance, uses the Velasquez Family Arms but with a purple snake instead of a white one. 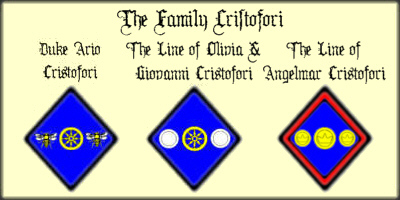 In large Families, different branches might have certain charges that set their members apart from the rest of the Family (the Cristofori Family has some particularly good examples of this). If a member of one Family marries a member of another, they will often modify their Personal Arms to combine the symbols of both Families. This Family Tree (opens in a new window) shows some examples of this. Finally there are the City Shields. There are just four of these, one from each of the most powerful Families. They are used by the four High Captains of the High Guard, and feature a combination of the Family Arms and the arms of the High Guard. See the section on the High Guard for more details, or High Captain Matteus De Almedia for an example. On an Escutcheon Gules, Three Crowns Or. (Three gold crowns on a red field.) This is, in fact, the coat of arms of the Governorship of the White City, but has been adopted by the Family De Courci as a matter of course. Currently used by Her Eminence Rebecca De Courci. 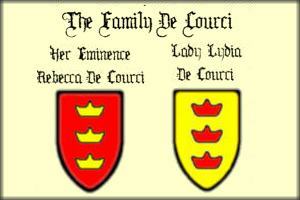 Lady Lydia De Courci (RIP) - On an Escutcheon Or, Three Crowns Gules. (Three red crowns on a gold field.) A simple reversal of her mother's arms. Stephano De Courci - On an Escutcheon Azure, three Roses stalked Gules each surmounted by a Crown Or. (Three red roses growing behind gold crowns, on a blue field.) A shield that reflects his worship of the Rose Princes. On an Escutcheon Gules, a Spider rampant guardant Sable eyed Vert. (A black, green-eyed spider, rearing as if to attack and facing forward, on a red shield.) Currently used by Duke Vitaliano and Duchess Lucilla De Almedia. A Note on the Champion of the White City - The Champion of the White City traditionally adds a horizontal white sword (a blazon surmounted in chief by a Sword fesswise Argent) to their coat of arms to signify their title. The champion chosen to represent the city is almost always a member of the city's nobility and often a member of the High Guard - there may be commoners who are better warriors, but many of those in charge wouldn't consider it proper to have a commoner representing the White City. Ratrina De Almedia - On an Escutcheon per pale Gules and Vert, a Spider displayed Sable. (A black spider on a red and green shield.) A shield showing Ratrina's more rural roots through using a half-green shield. By choice the spider is drawn stylised rather than realistically. On a Cartouche Sable, a Scitalis upright assurgent Argent. (An upright silver serpent, poised to strike, on a black oval field.) Currently used by Duke Nerino Velasquez. Federico Velasquez - On an Escutcheon Argent, a Turret Sable entwined by a Scitalis Argent. (A black tower with a silver snake wrapped around it, on a silver shield.) After getting engaged to Erica de Velland, Federico used the arms designed for them by Arbella Luxfrey (see below). However after Erica's untimely death partly due to Arbella's fault, Federico changed his arms to make the tower black for mourning. Jenevieve Velasquez - On an Escutcheon Argent, a Scitales Sanguine. (A black shield with a blood-red snake.) Jenevieve Velasquez has recently adopted a new set of arms, with a blood-red serpent to show her interest in Blood. On a Lozenge Azure, a Wheel Or between two Bees volant Proper. (A golden wheel on a blue diamond field, between two flying bees in natural colours.) Used by Duke Ario Cristofori. The line of Agelmar Cristofori - On a Lozenge Azure, three Bezants bearing Crowns on their faces, within a Bordure Gules. (Three gold coins with crowns on their faces, on a blue diamond field with a red border.) There are those who speculate that the red border and three crowns appearing on this line's arms are a veiled reference to the claims of Lucrezia Cristofori, Agelmar's grandmother and the matriarch of the branch, to be an illegitimate descendant of some exiled White City Governor. These claims have never been disproven, but it's generally considered gauche to mention them in front of the De Courcis. 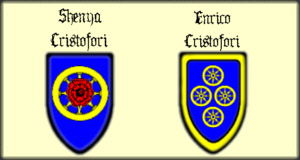 Enrico Cristofori - On an Escutcheon Azure, four Wheels Or, within a Bordure Or. (A shield with four golden wheels inside a golden border.) Not often used by Enrico, as the lack of any charges except wheels shows his family are unheroic transport agents. Duke Lemuel D'Artois - On an Escutcheon Octargent, a Manticora rampant Or armed Sanguine. (A shield divided into eight fragments, each a different shade of silver, and bearing the main charge of a golden manticore with blood-red teeth and claws.) Until recently, used as the personal arms of Duke Lemuel D'Artois. The Twin Dukes - On an Escutcheon Octargent, a Raven erect Sable respectant a Leopard rampant Or spotted Sable. (A shattered silver shield, featuring a black raven looking at a gold leopard with black spots.) The Twin Dukes Karl and Niske D'Artois combined their arms while they ruled the Port of Glass. Duke Karl D'Artois - On an Escutcheon Octargent, a Raven erect Sable. (A black raven on a shattered silver shield.) The personal arms of Duke Karl, ruler of the Isle of the Broken Moon. The Family Panastra - On an Escutcheon Gules, a Gemstone Argent, within a Bordure Argent. (A clear gem inside a white border on a red shield.) The Panastra Family's associations with the Burned Lords have always tended to appear in the personal arms of Family members rather than in the Family's arms themselves. The associations with Glass sorcery that the main charge of the shield suggests are usually dismissed out of hand by anyone with a working knowledge of the nobility. Erica de Velland - On a Cartouche per pale Sanguine and Sable, a Turret Or entwined by a Scitales Argent. (A golden tower with a silver snake wrapped around it, on a cartouche coloured blood-red on the right-hand side, black on the left.) The arms used by Erica following her engagement to Federico Velasquez, before her recent tragic death. Designed for them by Arbella Luxfrey as an engagement gift. The Family de Fideli - On an Escutcheon Azure, a Sword erect Or between a Talbot rampant respectant a Raven erect disclosed Sable. (A black dog and a black raven facing a golden sword, on a blue shield.) The De Fideli family are the newest addition to the nobility of the White City, Lord Sebastian having been ennobled for services to the City. Orpheus du Valle - On an Escutcheon Sable, on two Piles Azure, Feuilles Or. (Gold leaves on a black shield with blue triangles coming down from the top.) Orpheus is not, as far as anyone knows, a member of the nobility- but he bribed a Whistful City herald to register him these arms. The gold leaves show that Orpheus gets his money from dealing in 'herbs', whilst the black and blue design symbolises the Northern Mountains. In addition, this shield shows the old tradition of putting terrible puns & rebuses on shields. On an Escutcheon per pale Sable and Argent, a Mullet Irradiated Countercharged. (A shield with a rayed star on, split in half vertically, the right side black with a white half-star and the left reversed.) These arms clearly show the Luxfrey Family's connections to the Light. Belric Luxfrey- On an Escutcheon Sable, a Mullet Irradiated Argent. (A black shield with a rayed white star.) 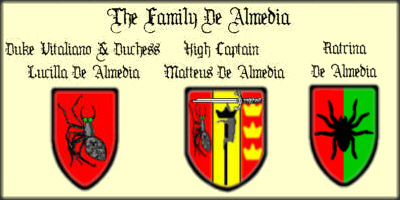 Belric uses the arms traditionally carried by the Head of the Family and his direct heirs. These arms are based on those of The Shining Order, showing the Family's long connection with the Order, but with a star instead of the sun. Note that the Luxfrey habit of the Head of the Family not bearing the Family Arms is a rare one in the nobility. Solric Luxfrey- On a Cartouche Argent, a Mullet Irradiated Sable. (A white oval field bearing a rayed black star.) Solric uses the pattern from Belric's arms reversed, indicating that whilst the Head of the Family is involved in material things and war the Family also has traditional links to a more contemplative life of spiritualism and meditation. Note the similarity to the Guang Shan temple arms, where Solric spent most of his childhood. Arbella Luxfrey- On a Lozenge Sable, a Crown Irradiated Argent. (A black diamond field bearing a rayed white crown.) Arbella's design has the same colours as her late father's arms (the same as Belric's) but features a crown to show that through her mother she is a minor member of the De Courci bloodline. It's on a lozenge because Luxfrey women normally don't fight. 1) As an aside, in the real world the Lozenge was historically used for the coat of arms of a woman. In the world of the White City there is a strong tradition of shieldmaidens, swordswomen and the like, so this is not the case. This being said, the shape is slightly more common amongst women than amongst men.